There has been quite a few apps claiming they are going to make it easy to see events from many angles. Using ‘friends’, merging photos together into some sort of viewable group. Most have been strong on one or two features but not providing a complete solution. The other end of the solution is apps that track every move of you and your friends to encourage sharing… that is just plain creepy!! I was disappointed with a couple options that let you share pictures if you knew in advance who was going to be there, request and they accepted your invite to a shared area, etc… Usually those people are standing right next to me at the event so what does the share do for me?! 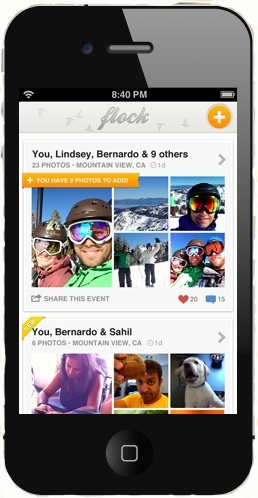 The folks that do the Bump app, which handles transferring contacts and photos by bumping iPhones, are now taking a crack at filling the need for friend event photo sharing. The app, Flock, is an iPhone app that pulls together pictures your friends took at an event and puts them in a shared album. The info on Flock states that you can use any app to take the pictures with, so it would appear it uses the EXIF info for time/location rather than having to do it’s own unique ID. The app does require you use your Facebook login as it’s login. Normally, this is just a way of letting Facebook handle the security of logins, but in this case it is how Flock knows who your ‘friends’ are. When first launching Flock, your asked to allow the app to use Location Services. Like Bump, this means you have the location icon showing all of the time. With some apps, your battery goes down much quicker when something is constantly pinging the location, but Bump claims their apps are better at it and shouldn’t have a negative impact. The apps need to know your location in order to judge it against other users location. In the case of the Bump app, so you can transfer files, in the case of Flock so it knows when multiple users are at the same event. Knowing where your at, that there are photos tagged with the time and location of the location, who your Facebook friends are, and if they were at the same location taking pictures, an album is created for you. Flock works in reverse too so if an event you took pictures at was also attended by a Facebook friend of yours, a push notification will let you know an album will be created from that event too. Of course, this does mean all of that information is sitting on a company’s servers to make the connection. How much of my every move being tracked by someone is worth the convenience of having a group photo album be created? Tough question that every individual has to answer for themselves. It would be nice if something could be done with the collection of photos, Flock Album outside of just viewing in the app and relying on Flock to get your viewing pleasure right. A couple important positives… your photos are not shared with your friend’s Flock albums without you OKing it and they are not posted to Facebook automatically either (sharing a photo can not be undone though).